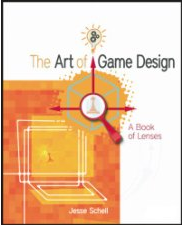 Although I am not even half way in reading “The art of game design; a book of lenses” by Jesse Schell (Focal Press, 2008), I can already say that this one makes a difference! The author has a background in developing “experiences” like theme park attractions, board games, and video games. 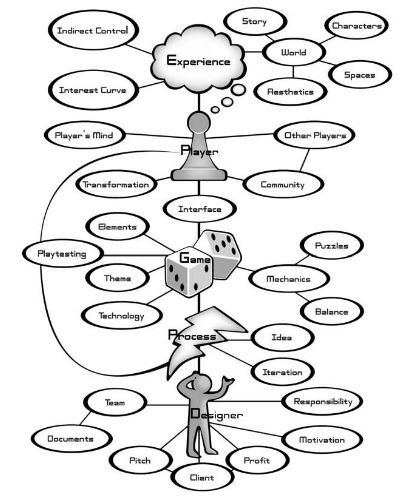 He therefore takes the “user experience” as point of departure in (game) design. He walks from experience to player, from player to game and ultimately from the game to the process of game development, 32 chapters long. In each chapter he presents a couple of viewpoints, lenses as he called them, to look at game design, 100 in total. Each lens consists of a question or issue and related answers, suggestions, etc. The set of lenses act as flash cards and reminders. Starting with the user experience and being experienced himself in much more than video game design alone, the author created a book that is of value not only for video game design, but also for designing board games, learning exercises, workshops or complex events like conferences. The 100 “lenses” from the book, also are available as a card deck. The card deck, has been transformed to an iPhone application. And the latter is free available. Pieter van der Hijden (Sofos Consultancy) 2012 – Except where otherwise noted, content of this publication is licensed under a Creative Commons Attribution 3.0 License.